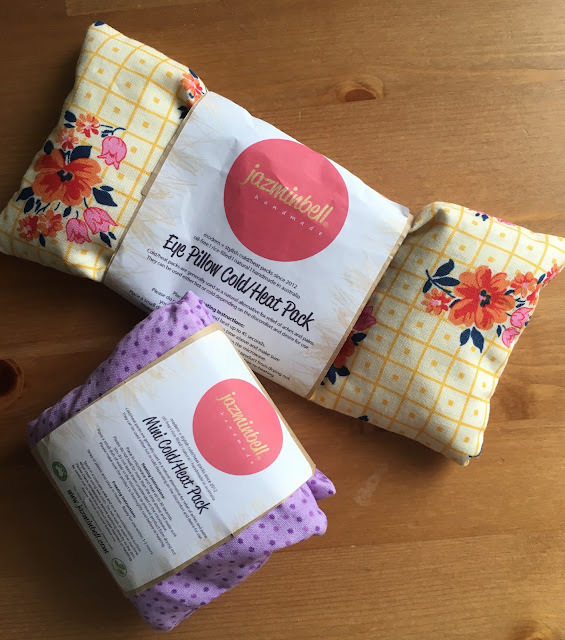 All natural, and it comes in really colourful and cute designs, JazminBell's cold/heat packs are a current favourite of mine! When I got the package, it was a mental battle whether I should just keep the packs in the corner - they look so dainty and a wonderful pop of colour that it felt so wrong to use it! They smelled so good too that I ended up having one too many whiffs than I would ever care to admit. a. after placing the product in the microwave, it was just the right amount of hot - not burning or scalding hot. b. no waiting time to use it - after it was heated for a few seconds, that was it. c. no more water spilling out of the bottle and getting wet in the process. d. convenient - lesser things to prepare. No need to boil water, get a thick towel. All you need is the microwave (for heat pack) or the fridge (for cold pack) and you're all set. I thought because the warmth of the heat pack is "just right" and not too hot as with the rubberised water bottle, I may need to microwave it every so often. Surprisingly, it managed to stay warm for a few minutes and it was all I needed to get relief. A definite plus! Time-saver, convenient, less fussy, all natural, comes in really cute and pretty designs, what's not to like about this product? Head on over to JazminBell's site to know more about her all natural and cute products. This post is brought to you by JazminBell. I received JazminBell heat/cold packs to try for myself and review, but all opinions stated are my own based on my experience with the product.